Do you trade with Bollinger Bands? Bollinger Bands are used by hundreds of thousands of traders around the world. In fact, it’s considered one of the most powerful trading tools available to traders. Over the past two decades many professional traders at large funds, successful Commodity Advisors, and professional Equity Traders have stated they rely upon Bollinger Bands as one of the main indicators before they take a trade. When traded correctly, Bollinger Bands can be one of the most consistent strategies available for your trading. Now for the first time, we are making available to the public a fully systematic, quantified approach to trading with Bollinger Bands. What you will learn with this strategy are dozens of Bollinger Bands strategy variations which have been correct from 65.43% up to over 82.74% from January 2001 to May 2012. As you may know, trading with Bollinger Bands can be very subjective. What we have done is remove the subjectivity and quantified for you hundreds of exact Bollinger Bands set-ups which have seen reliable gains with a high percentage of the trades being successful. As professional traders have found, Bollinger Bands, when used correctly, can identify for you high probaility trades over and over again when used correctly. Here are the top 10 strategy variations in Trading with Bollinger Bands® – A Quantified Guide. 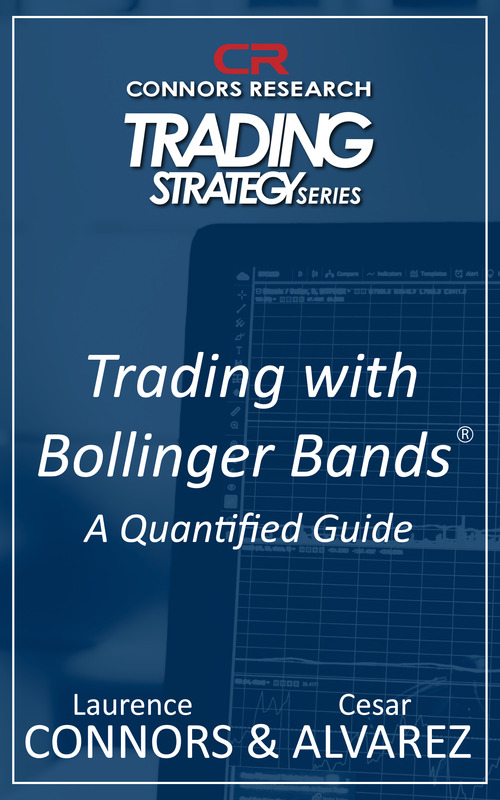 Trading with Bollinger Bands® – A Quantified Guide is right for you if you trade options. The historical returns have been strong and professional traders understand the power of applying options to their equity trading. In this guidebook you’ll be able to do the same by combining Bollinger Bands with options trading. As a bonus we’ve also added day trading to this strategy for those of you who day trade with Bollinger Bands. When you order Trading with Bollinger Bands® – A Quantified Guide, you will also be invited to attend a live conference call with me where we will discuss the trading strategy in-depth and also answer any questions you have. If you cannot attend the live call, it will be recorded for you to listen to anytime. Also, you can email questions directly to us after listening to the presentation. The price of Trading with Bollinger Bands® – A Quantified Guide is $100. It comes with a 100% Money Back Guarantee (as do all the Guidebooks in our Strategy Series). Use the strategy for 60 days. If you are not fully satisfied with the results, you will receive full refund of the purchase price. Whether you day trade, swing trade, or trade options, Trading with Bollinger Bands® - A Quantified Guide will make you a better, more powerful trader. . If you are looking to trade the most consistent quantified rule based strategies available to traders today, order Trading with Bollinger Bands® - A Quantified Guide. 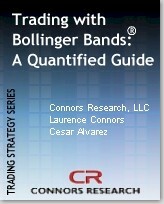 Quantified analyses on Bollinger Bands from 2001-May 2012. A practical guidebook of strategies with clear instructions how to apply entry / exit filters that show historical tendencies to improve the winning edges and average gains of the best systematic strategies to trade Bollinger Bands. Trading with Bollinger Bands – A Quantified Guide is backed by our 100% money-back guarantee. If you are not completely satisfied with this strategy just let us know within 60 days and you will receive a full refund. For over 15 years, Larry Connors and now Connors Research has provided the highest-quality, data-driven research on trading for individual investors, hedge funds, proprietary trading firms, and bank trading desks around the world. You will not find these strategies published anywhere else. Institutional money managers make decisions based on sophisticated, computer-run analyses of massive amounts of trading data. So do we. So should you. We quantify precise patterns to improve your trading decisions. Our proprietary database spans over two decades, with more than 12 million quantified trades. From best-selling books, like "Short Term Trading Strategies That Work", to our PowerRatings subscription service, to institutional software products, Connors Research continues to give professional traders and asset managers the tools to achieve professional-level results. Chairman & Founder, Connors Research. Larry Connors has over 30 years in the financial markets industry. His opinions have been featured at the Wall Street Journal, Bloomberg, Dow Jones, & many others. Mr. Connors has been an active trader since 1981. His strategies and research are used by thousands of traders throughout the world. Director of Research for Connors Research LLC. Previously, Mr. Alvarez was a senior developer of Microsoft Excel. For the past 12 years, Mr. Alvarez has been a professional market researcher. Mr. Alvarez has been at the forefront of stock market research, having developed a number of trading systems now used by investors and fund managers in the United States and internationally. Exact high probability Bollinger Band levels for equities.